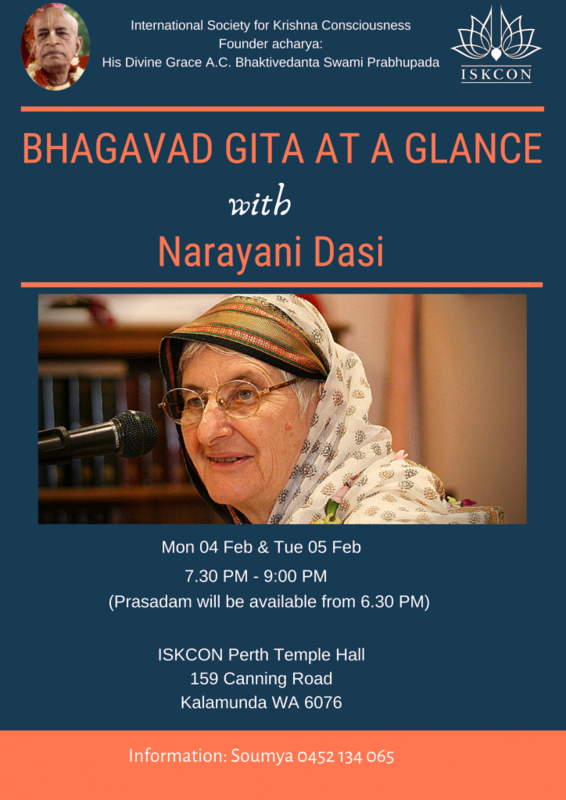 We are pleased to inform you that HG Narayani Dasi will be conducting a seminar Bhagavad Gita at a Glance on Mon 04 Feb and Tue 05 Feb from 7.30 PM – 9.00 PM (Prasadam will be available from 6.30 PM). Narayani Dasi a disciple of His Divine Grace AC Bhaktivedanta Swami Srila Prabhupada, joined ISKCON in Boston in 1970. She has done many services for Srila Prabhupada including Deity worship, travelling book distribution, and teaching Bhakti Sastri, Bhakti Vaibhava and Bhaktivedanta courses in VIHE in Vrindavana. She helped develop the VTE curriculum for Bhakti Shastri and has written a series of fifteen books including Srimad Bhagavatam At a Glance and Bhagavad Gita at a Glance. She has been residing in Sri Vrindavan Dham for many years. She visits temples in countries all over the world including Australia, New Zealand, Europe, and the USA. Please take advantage of her visit to Perth, and get an easy-to-understand overview of Bhagavad Gita – the life manual for mankind.